Be the first to share your favorite memory, photo or story of Doriss. This memorial page is dedicated for family, friends and future generations to celebrate the life of their loved one. 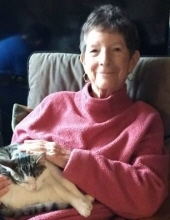 Doriss Dameron Ownby, 75, of Catersville, passed away January 30, 2019. She is survived by her sons, Allan Ownby of Arizona, Greg Ownby (Adrienne) of Powhatan, David Ownby of Cartersville; two nieces, Kristie Ringuette, Kerry Begley; two grandchildren, Hannah and Jaks. She was preceded in death by one sister, Anyce McCracken. Mrs. Ownby touched many lives through teaching school for over forty years at St. Benedicts Catholic School and Powhatan County Schools. A celebration of her life will be held at a later date. To send flowers or a remembrance gift to the family of Doriss Dameron Ownby, please visit our Tribute Store. "Email Address" would like to share the life celebration of Doriss Dameron Ownby. Click on the "link" to go to share a favorite memory or leave a condolence message for the family.